5 Lakes Brewing, Door—HIPPY SPEEDBALL (ABV: 3.7% | IBU: 20). This Brown Ale has a nice roasty malt flavor but is not too heavy. The Espresso Beans add a nice punch to the tastes buds to wake them up! Arbor Brewing Company, Ann Arbor—ESPRESSO LOVE BREAFAST STOUT (ABV: 6.7% | IBUs: 15). Oatmeal and 20 pounds of fresh roasted coffee from a mix the Ugly Mug Café and Hyperion Coffee in Ypsilanti, MI contribute to a mildly chalky espresso character balanced by a rich, sweet creamy maltiness. Coffee finish dissolves into chocolate with a slight toasty bitterness. Pairs well with desserts, especially dark chocolate, raspberries and cheesecake. Baffin Brewing, St. Clair Shores—BOB BARLEY (ABV: 8.5% | IBUs: 65). Brewed with a mixture of malts including carafa malts, chocolate malt, roasted barley and black malt. We balance the brew to allow the coffee to flourish and shine without being overwhelmed by a traditional imperial stout profile. We hand select the beans with our friends over at New Order Coffee in Midtown Detroit, MI and have them roast the beans. After allowing the beans to de-gas for two days we cold brew them in a tank free of oxygen for 18 hours. Once the cold brew is finished we blend the coffee with the stout to create our Bob Barley. Originally named due to us using 100% Jamaican Blue Mountain coffee, until the flavor profile of the bean changed. Now we stick to Brazilian or Colombian to hunt for a nutty / chocolate flavor. We use cold brewed coffee instead of hot coffee or espresso is due to two reasons: 1. Hot coffee is very acidic and quite astringent. Hot coffee and espresso is highly susceptible to oxygenation and tends to stale quite quickly. Cold brewed coffee has a more neutral PH compared to its hot counterpart and lasts much longer. 2. Cold brewed coffee has a much much different flavor than hot or room temperature brewed coffee. The coffee is significantly smoother, more balanced, and nuttier. It’s also delicious barrel aged (Vanilla, coconut, bourbon, and much more oak flavors)!! Bastone Brewery, Royal Oak—CAFE BLANCA (ABV: 6.3%). Café Blanca, or white coffee, is a twist on conventional darker coffee beers. This golden Belgian style ale is brewed with coffee and cocoa nibs and has a rich coffee aroma and delicious cocoa finish. Final Gravity Brewing, Decatur—EYE OPENER (ABV: 9.8% | IBUs: 55). This Russian Imperial Stout brewed with two types of chocolate and two different coffee beans. Huge coffee notes with subtle chocolate flavors and a heavy body. Founders Brewing, Grand Rapids—BREAKFAST STOUT (ABV: 8.3% | IBUs: 60). The coffee lover’s consummate beer. 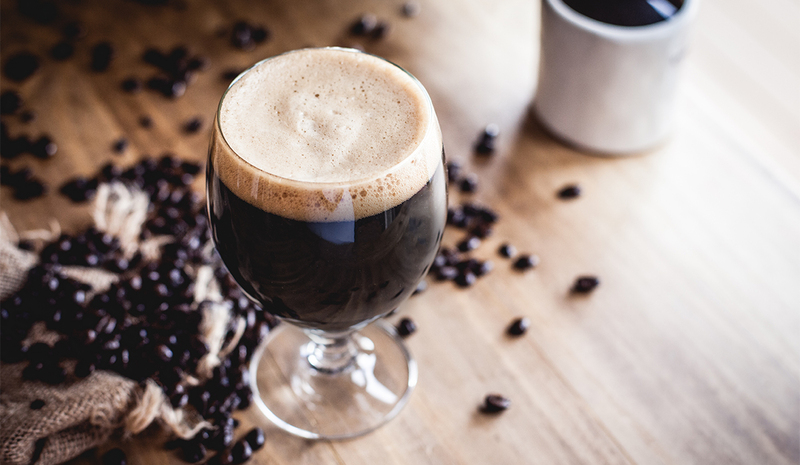 Brewed with an abundance of flaked oats, bitter and imported chocolates, and two types of coffee, this stout has an intense fresh-roasted java nose topped with a frothy, cinnamon-colored head that goes forever. Grand Armory Brewing, Grand Haven—ALDEA ESPRESSO MILK STOUT (ABV: 5% | IBUs: 25). This espresso-infused stout features fresh Aldea Coffee espresso shots! This stout also contains lactose which provides a sweeter taste and a rich creamy mouthfeel. Newaygo Brewing, Newaygo—UNCOMMON ESPRESSO STOUT (ABV 5.8% | IBUs: 35). Oatmeal Stout with fresh ground Espresso Roast from Uncommon Coffee Roasters in Saugatuck. A couple times each year we serve it on cask and it is like a Beer Latte. North Peak Brewing—PERK (ABV: 6.8% | IBUs: 21). This Coffee Rye Ale is brewed with plenty of rye malt and Mighty Good Coffee and is available exclusively at Avalon Cafe Ann Arbor and Avalon Cafe Detroit. One Well Brewing, Kalamazoo—SWEET WATER STREET (ABV: 7.1% | IBUs: 49). This coffee donut porter is made with donut holes from Sweetwater’s Donut Mill and Water Street Coffee Roaster, both local staples in Kalamazoo. Our Brewing Company, Holland—STUDY BUDDY MILK STOUT (ABV: 8% | IBUs: 20). This smooth and robust milk stout that is brewed with lactose sugar and Mad Cap Coffee. Petoskey Brewing, Petoskey—SUPER TROOPER COFFE & DONUT BROWN ALE (ABV: 7.3% | IBUs: 12). This winter seasonal is a brown ale that has chocolate malt, Colombian coffee and donuts in it, sourced from local companies. The coffee grounds are from Higher Grounds in nearby Traverse City and the donuts are from Johan’s Pastry Shop in Petoskey. Ten percent of total sales of Super Trooper will benefit Michigan Concerns of Police Survivors. MI-C.O.P.S. is a nonprofit that provides support to the families, friends and colleagues of law enforcement officials and police officers who have died in the line of duty. The organization offers information, support programs, retreats, activities and events that all those affected by the loss can take part in throughout the year. Hudsonville Pike 51 Brewing Co, Hudsonville—SABOTAGE (ABV: 6.3% | IBUs: 27). A deep and rich milk stout made with fresh roasted Ethiopian coffee from Rowster New American Coffee. Roak Brewing, Royal Oak—HIGHER GROUND – TURKISH COFFEE STOUT. (ABV: 6.2% | IBUs: 38). A Strong, firm, yet surprisingly smooth Turkish Coffee Stout. We took inspiration from the lightly spiced after dinner coffee drink originally from the Middle East. We brewed a creamy stout with coffee beans from Ferndale’s own, Chazzano Coffee. Delicious, drinkable and a coffee lover’s dream. Rochester Mills Beer Co., Rochester & Auburn Hills—WOODWARD BOLD COFFEE MILKSHAKE STOUT (ABV: 5.0% | IBUs: 19). This coffee milk stout is brewed with Detroit Bold Coffee Co.’s locally roasted 100% Arabica Woodward Ave. blend coffee beans. The latest in the series of flavored versions of Milkshake Stout, Rochester Mills’ most popular brew. A cup of local joe and a beer come together for an intricate and unique taste to be enjoyed any time of day. Woodward Bold pairs as easily with chocolate cake as it does with a hearty steak and eggs breakfast. Also available on Nitro. Limited run through the end of 2017. Starving Artist Brewing, Ludington—COCONUT RUBENESQUE (CCR) (ABV: 6.5% | IBUs: 27). CCR utilizes locally roasted coffee and does not use locally grown coconuts. Sweet, roast, strong coffee notes, and subtle coconut. This medium bodied milk stout is enjoyable year-round. Tecumseh Brewing Co., Tecumseh—A FINER TEMPTRESS (ABV: 7.2% | IBUs: 20). This blonde ale brewed with oats and creme brûlée coffee. Unity Vibrations, Ypsilanti—COLD BREW COFFEE KOMBUCHA (ABV: 1.5%). Featuring organic and fair-trade Honduran beans sourced from Roos Roast in Ann Arbor blended with plain Kombucha tea. We make an in house coldbrew at unity, add it at time of bottling and it does a bottle condition. Wolverine State Brewing, Ann Arbor—BARISTA (ABV: 6.5% | IBUs: 13). As brewers, we wanted to combine what we start the day with (coffee) and end the day with (beer) into one mystical elixir: Barista Cold Brew Coffee Lager. With bountiful roastiness, toasted malt and hints of cocoa, Barista boldly illustrates what a harmonious pair coffee and beer can be.